Brother HC1850, a sewing machine that comes with plenty of amazing features, all aimed at helping you sew faster and more efficiently. This is the ideal machine for beginners and experts as it handles all sewing project easily. 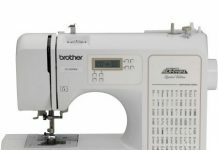 It is a computerized Quilting and sewing machine, the largest of the Brother brand. It features buttons that can easily be accessed at the front of the machine. There is also a printed reference chart with which you get to select your stitch. It combines many features making it a terrific fit for every fashion designer out there. The Brother HC1850 sewing machine also comes with amazing accessories that makes it ideal for advanced and first time users. There is a collection of feet which makes sure you are well covered for any job at hand. Bobbin is an important part of sewing which helps with portioning and holding out thread. It is critical to any project with the sewing machine yet, they are one of the most meticulous parts of the machine. 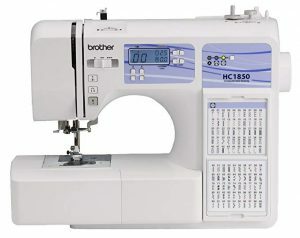 To make things easy, Brother HC1850 comes with an easy bobbin system. To have a successful project, you must know how to feed your material into the machine the right way. As a result, the feeding system comes with a guide on both sides of the machine to make sure that your material is fed straight, the right way. Also, the tendency of the machine bundling up is reduced greatly with the sleek build. To be able to quilt successfully, you need a reliable machine because quilts are long term and meticulous projects. This machine comes with drop feed ability which makes sure that you have less snags. First time sewers for instance could have a hard time coping with high speed of the sewing machine. Extremely low speed can also be downright frustrating. The Brother HC1850 comes with LED lighting that lights up your workspace. Hence, you are not limited or constrained to sew at a particular time of the day. This is a beautiful feature to people who need assistance with their vision. Also, you’ll need the light to sew dark fabrics easily. Another great thing about Brother HC1850 is that replacing of needles is very easy. There is a needle position button just below the speed controlling slider which helps lift the needle. Switch off power and let go of the presser foot. With a disk shaped screwdriver that you can get from tool – kit, remove the needle by losing the screw. When you are done with this, you can replace the old needle. 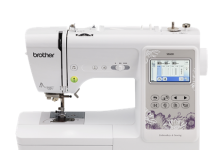 If you need a versatile sewing machine that can sew and quilt, the Brother HC1850 is a terrific choice. It is a good choice because of the reasonable price hence, recommended for beginners. There are abundance stitches to choose from which makes it stand out from many sewing machine within its price range. 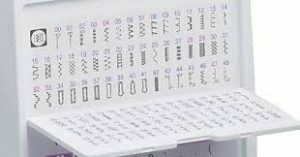 The threading system is easy with an automatic threading feature as well. 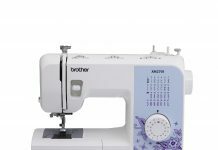 All in all, the Brother HC1850 sewing machine is a good choice!